1. 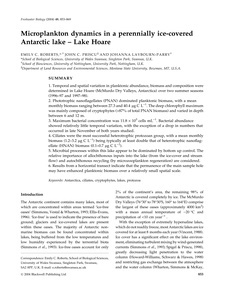 Temporal and spatial variation in planktonic abundance, biomass and composition were determined in Lake Hoare (McMurdo Dry Valleys, Antarctica) over two summer seasons (1996� and 1997�). 2. Phototrophic nanoflagellates (PNAN) dominated planktonic biomass, with a mean monthly biomass ranging between 27.3 and 40.4 lg C L)1. The deep chlorophyll maximum was mainly composed of cryptophytes (>87% of total PNAN biomass) and varied in depth between 6 and 12 m. 3. Maximum bacterial concentration was 11.8 � 105 cells mL)1. Bacterial abundance showed relatively little temporal variation, with the exception of a drop in numbers that occurred in late November of both years studied. 4. Ciliates were the most successful heterotrophic protozoan group, with a mean monthly biomass (1.2�2 lg C L)1) being typically at least double that of heterotrophic nanoflagellate (HNAN) biomass (0.1�7 lg C L)1). 5. Microbial processes within this lake appear to be dominated by bottom up control. The relative importance of allochthonous inputs into the lake (from the ice-cover and stream flow) and autochthonous recycling (by microzooplankton regeneration) are considered. 6. Results from a horizontal transect indicate that the permanence of the main sample hole may have enhanced planktonic biomass over a relatively small spatial scale.